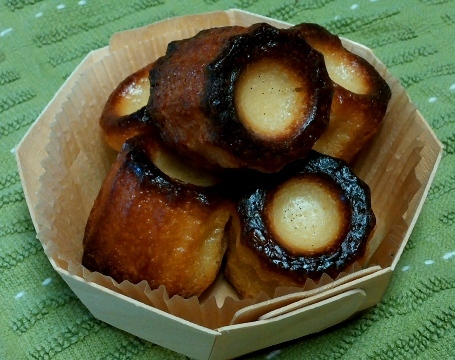 For anyone fond of custard creations like crème brûlée or flan, you are hereby forewarned about canelés. On first glance, they don’t look like much. Not known for perfect shape or artful finish, the crisp little cakes may appear more like pâtisserie rejects—some malformed, with exteriors ranging from extremely dark to downright burnt. But, if there is heaven in a bite, this would surely be it. Beware: it takes only one to set off a profound physical and/or spiritual reaction. It may also make your eyes bug out and simultaneously cause you to swoon. Canelés are not new; they have been around France for centuries—and could be one of their better kept secrets. These charmers have a fascinating pedigree. Hailing from the Bordeaux region, the crepe-like batter was originally baked in tin-lined copper molds, brushed with bees wax. Turns out the bees wax provides a natural non-stick coating, along with a lovely hint of honey flavoring. It was discovered that baking them in a very hot oven caramelizes the exteriors to resemble something like the tops of crème brûlée. Meanwhile, their interiors develop an enchanting cake-like custard filling. 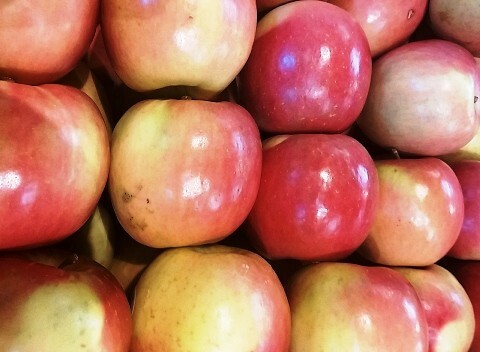 It is this contrast in textures and flavors that yields a package in a class of its own. Without competition. Once on the canelé trail, I was thrilled to discover that there are alternatives to the horrifically expensive copper molds. Silicone molds are also available; they are affordable, easy to work with and provide surprisingly good results. As far as baking with beeswax, that is still to come; I buckled and added a bit of honey to my batter as a tasty alternative. Food grade quality beeswax is available on line at a number of websites. Scald the milk and butter until bubbles form on edge of pan (183 degrees), remove from heat and add the vanilla. Cool to warm. In medium bowl sift the flour, sugar and salt together and make a well in the center. Lightly beat the eggs with a fork and pour them into the center of the flour. 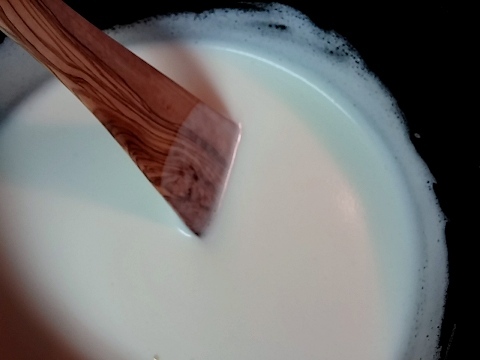 Add the milk mixture and stir with a spatula to incorporate the wet with the dry. 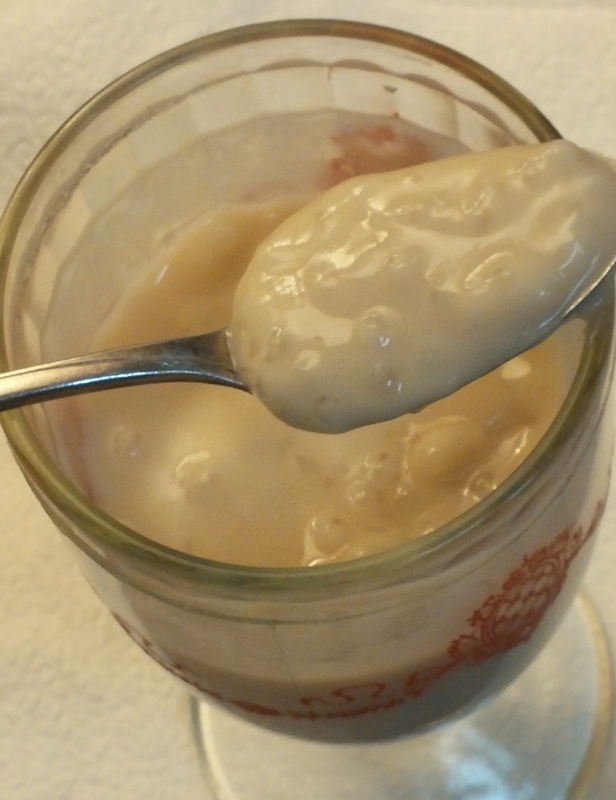 To remove lumps, pour mixture thru a sieve into a holding container. Cover and refrigerate for at least 24 hours, preferably 48 hours, and up to 3 days. The day of baking, brush silicone molds with butter. Preheat oven to 475 degrees. 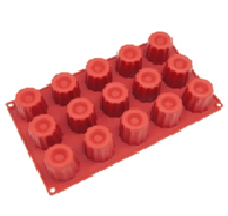 Set molds on rack over baking sheet in oven, close door and reduce heat to 425 degrees. Bake for 15 minutes. If browning unevenly, reverse the molds. Close the door and reduce the heat to 350 degrees. Bake for an additional 45 to 60 minutes, until very dark brown, almost burnt. Continue to reverse the molds every 20-30 minutes. Let canelés cool in their molds (about 10 minutes) on wire rack — this will help them firm up and avoid collapse. 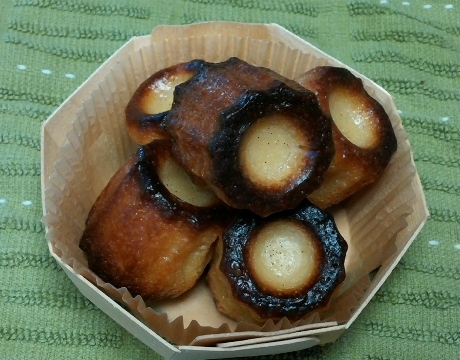 Remove from molds, place canelés on their sides on cooling rack; they will become crisp and more stable as they cool. Wipe out molds with toweling to remove any baking debris and repeat; it is not necessary to brush the molds with butter for 2nd Yield: about 36 canelés. Canelés are best eaten the same day. To freshen, reheat in 450 degree oven 5-10 minutes. Even the names are enchanting: œufs à la neige (eggs in snow) and ȋle flottante (floating island). Picture pristinely shaped ovals nested in snowy cream, or billowy meringues adrift in a sea of custard. Pure fantasy. Although the French names suggest culinary ownership many countries claim their own unique versions. 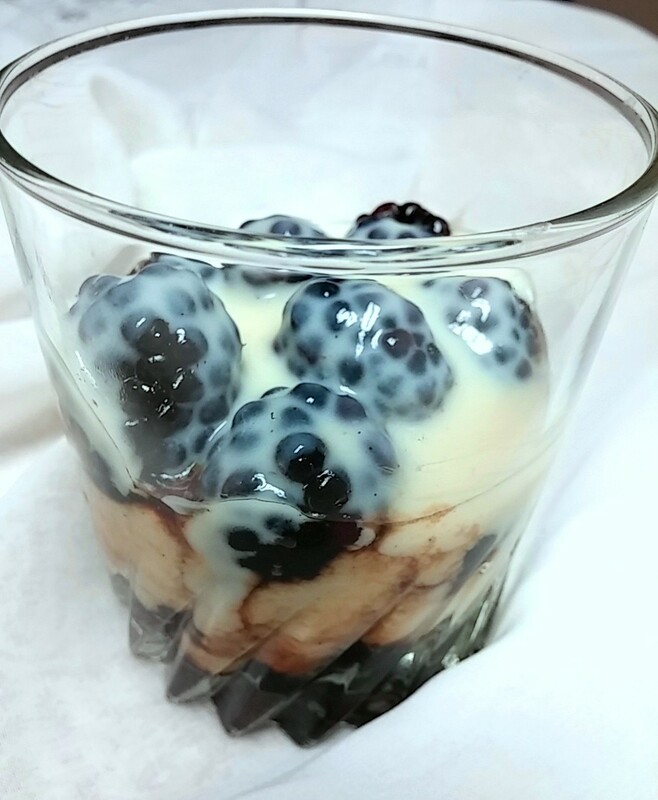 For the most part they are all about tender clouds of sweetened egg whites briefly poached and combined in some fashion with custard of eggs, milk and sugar. For years I was captivated by the name and wanted to give Eggs in Snow a try, but only paused, blinked, and moved on. It seemed daunting; a lot of work for something that appeared simplistic and inconsequentially light. But I was wrong. 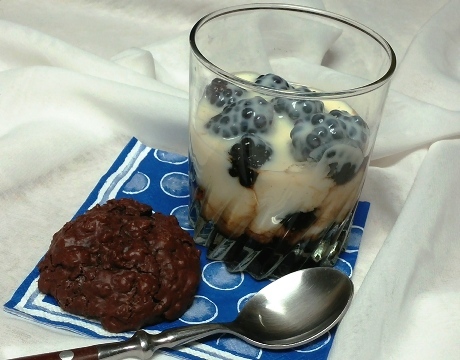 This is a complex dessert with both great style and whimsy; a sweet with such wide appeal that it would play equally well to adults and children as well as the healthy and the infirm. Perhaps I have had a major culinary shift. These days I am in awe of all the well-constructed basics that incorporate eggs: i.e., meringues and custards. In this case, I was pleased to combine two of my favorite things and carry it a step further. 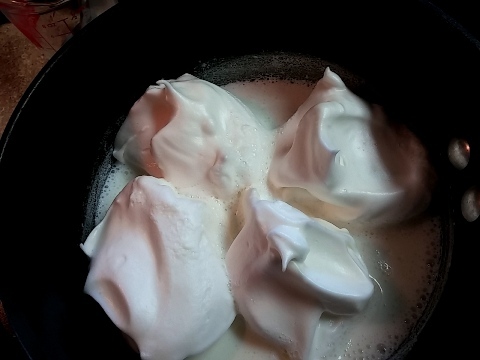 I was fascinated by the process of poaching meringues in simmering liquid. I watched as the beaten egg whites swelled into moist, firm puffs of air; the most perfect ‘marshmallow fluff’ imaginable. 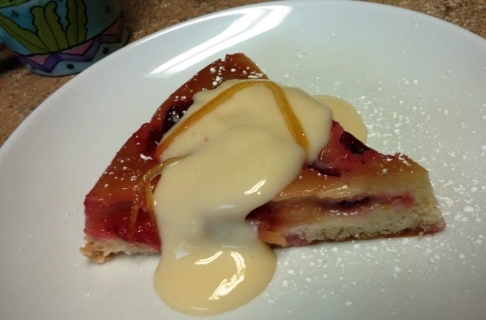 Of course, anything that includes custard has long been a friend of mine. In this case, crème Anglaise thriftily transforms the residual yolks into a thin, regal custard—the sea upon which the islands of meringue rest. Ah, those lovely Floating Islands. 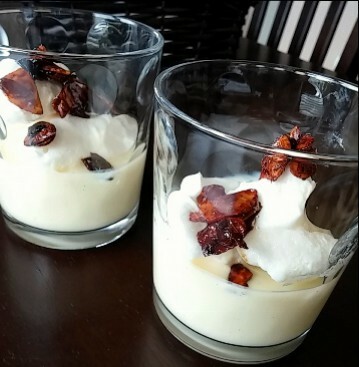 I spooned the custard sauce into individual glasses and perched a couple of the meringue clouds atop. For contrast, I sprinkled on a few crunchy candied almonds. You would not think one of these elegant beauties would be enough—so light and ethereal, yet I was amazed and completely satisfied. 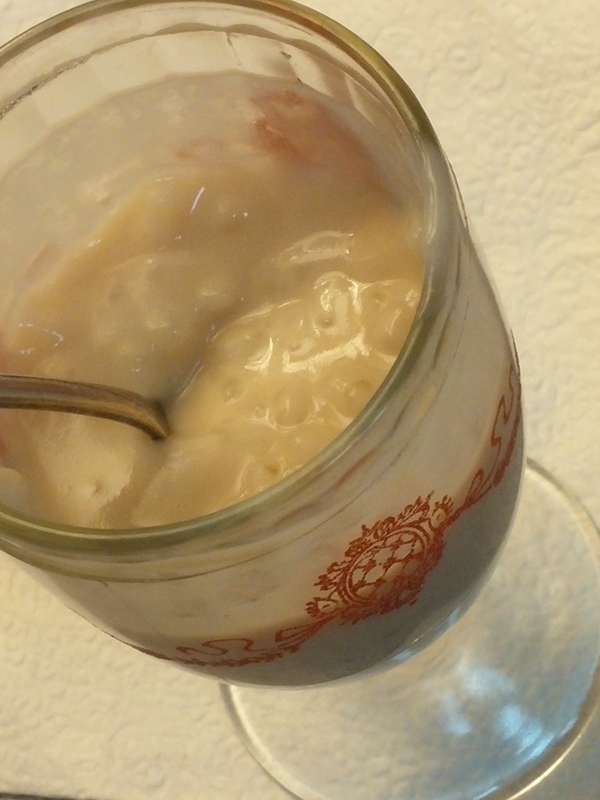 As with some île flottantes, perhaps the addition a cookie or bit of cake is in order. It’s your call. 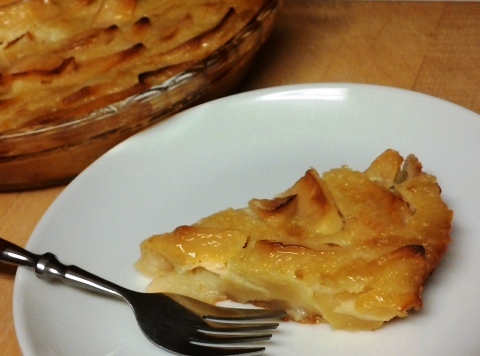 Whatever you call it, it is not a dessert easily forgotten. 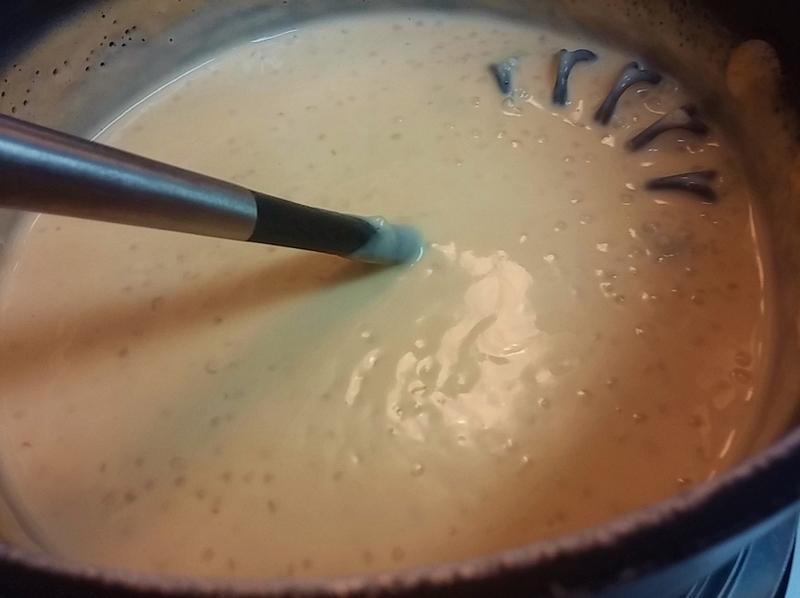 In a wide pot over medium high, heat milk and sugar to dissolve the sugar. Keep warm while preparing the meringue. 1. 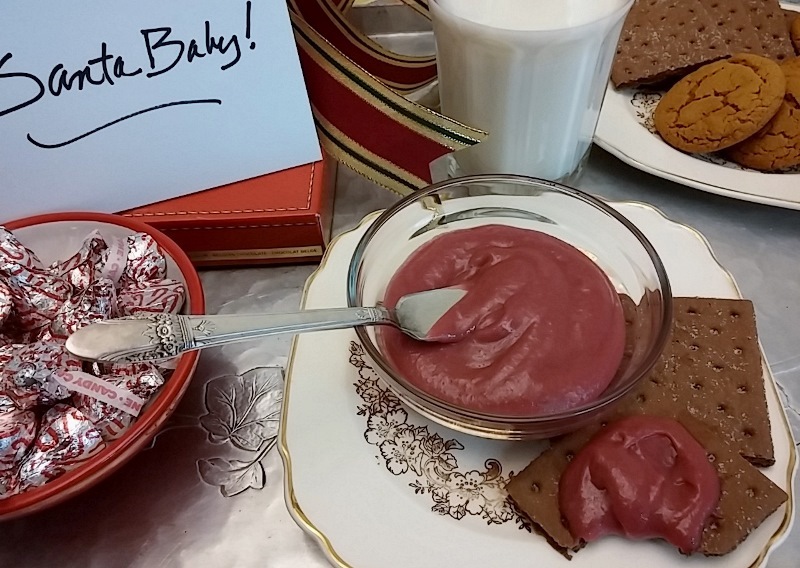 With electric mixer, beat the egg whites until foamy and add the cream of tartar. Continue beating the whites until a firm foam forms. Add the salt and then very slowly add in the sugar, beating until whites are glossy and thick with soft peaks. Add the vanilla and beat until stiff peaks begin to form. 1. Using 2 serving spoons shape the meringues into attractive ovals and gently lower the spoonfuls into the simmering milk. 2. Poach the meringues about 2 minutes per side; turn when set and cook on the other side. Remove with slotted spoon and set on toweling to drain; and repeat. 1. Strain the poaching liquid and add enough milk to equal 2 cups. Heat the milk in a small pot until it is hot but not boiling. 2. 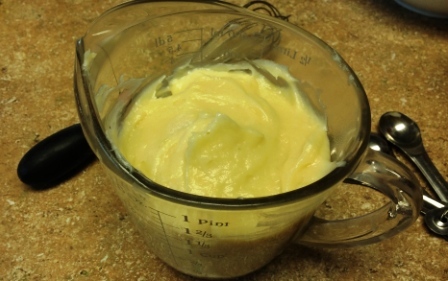 In a medium mixing bowl, with a hand held mixer, beat the egg yolks until frothy and slowly whisk in the sugar; continue beating until it is thick and light in color. Slowly stir in about 2/3 cup of the hot milk to temper. 3. 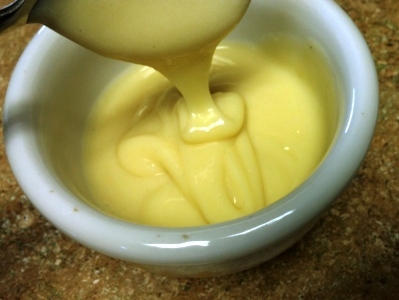 Lightly whisk the custard back into the pot of warm milk. Over low heat stir constantly until it is hot and coats the back of a spoon and when a line drawn through it does not run. 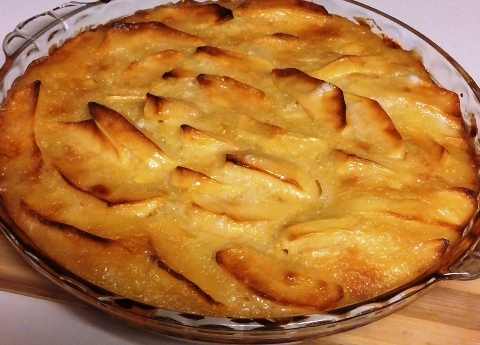 It should reach about 170 degrees: a few bubbles may appear along edges but it does not boil. Add the vanilla and strain into a clean bowl to cool. If refrigerating, cover the surface with plastic wrap to avoid skin forming on surface. 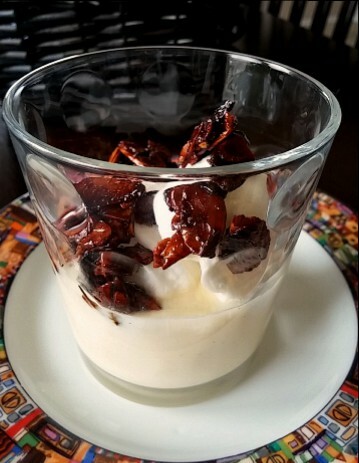 To Assemble: Spoon the custard into a low serving bowl, individual wide bowls or serving glasses; float the poached meringues on top and sprinkle with candied nuts or fresh fruit. Serves 4.